How can Aldi sell an Italian espresso machine for $149? Thread: How can Aldi sell an Italian espresso machine for $149? It will be interesting to see what results are reported. Says it is 15 bar Italian pump ... etc. I don't understand the question. Why couldn't they? The fact that it is Italian and has a 15bar pump doesn't make it good quality or expensive, those qualities are all independent of one another. I googled and found it on their Aldi Wednesday special. 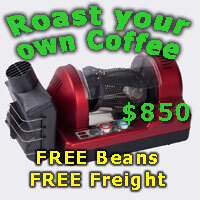 It's a classic appliance-type espresso toy, for sucking in consumers who think they want to try getting into espresso. Only to be misled that they don't like 'espresso'/coffee, without realizing the machine is the one to blame for. Thermoblock - will never get the brew temp properly, guaranteed. Advanced crema system - encourage folks to use stale preground coffee - horrible coffee experience ahead - doubly guaranteed. Frothing aid wand - bubbly dry cappuccino is the only thing this toy can spit out - forget trying to replicate those beautiful latte art from your favourite cafe. 3 years warranty - ensuring you have 3 years of bad coffee, that, or the coffee tastes so bad that you gave in way before the 3 year deadline, so the warranty will never have to be fulfilled. The best part? Italian espresso machines never ever brew at 15 bar. Very smart marketing. It's not an Italian espresso machine. Period. Is it made in Italy? 藍 or PRC? It's the pompa that's Italian. The rest looks like they may have done a deal to buy up the factory stock left over from Sunbeam and Brev. Take off the steam strudel maker and drill out the double wall basket. Buy some Aldi beans and a hammer and away you go! looking back, it wasn't very good...surprisingly, the steam function worked well for a thermoblock. Looks very similar to the Sunbeam Cafe Crema. One thing, I'm sure it will make better coffee than a Nespresso. If it brings someone onto their coffee journey it must be a good thing and is not going to break the bank. matth3wh, shewey, LexiconDevil and 2 others like this. I posed the question because when I visit my daughter for a week or two I have to get dressed and walk a couple of blocks to get four coffees for everyone then struggle back to drink not so warm coffee up to three times a day . Whether she would want to loose kitchen bench space is another issue as I doubt she would use it except maybe on weekends. I expect it would be better than their capsule machine which is better than instant which is not saying much. How drinkable is the real question. Just buy one, experiment with it and if you don't like it take back, if you do give to your daughter. The machine would pay for itself in a very short period of time and save your legs. Close to your father in law? The other thing to consider is that it's going to take you awhile to make those 4 coffees on the Aldi special. You may find the phone ahead and walk to the cafe and back takes as long. TK-1818R2A-WHT+STIRLING+Espresso+Machine+IM+White+V3.1.pdf Found the manual on Stirling Aldi A CS could probably say what is closest comparison. Appears baskets are of pressurised type. No information as to what is inside, what it is made of, stainless steel etc. Interesting, still thinking of the possibilities. The manual lists 10 parts, no wonder Italian machines can be kept going forever. A listing I saw for a Breville had about 100. Last edited by WarrenK; 5th August 2017 at 11:01 AM. You getting one Warren? 3 year warranty. Still sitting on the fence. Need someone with relevant experience to try it. Looks identical to the Breville "Cafe Roma" a friend bought a few years back, and has almost the same specs. The original Breville was mainly stainless, the next years model with the same name was 90% plastic. Cannot tell which is closer from the specs. 1) Will it make a genuine espresso? Straight out of the box, definitely not. For a starter you have to convert their portafilter to a naked. Then you have to get some unpressurised baskets ($25 or convert them with a holesaw). Then you need a reasonable espresso grinder (SB EM480 /500 or Breville "Smartgrinder" - both about $200) to feed the beast + more bench space to house the grinder. Then, IF you know what you are doing it can make a reasonable espresso. 2) Will it froth milk properly? Yep, IF you know what you are doing. 3) After all that, can I do espresso for 4 people? Probably not. The temp control is really only good enough for one shot at a time with a recovery period of a few minutes. Possibly as long as half an hour between first and last victim if you want to provide a fairly good cuppa. Allow even more time if they all take foamed milk. PS: I did win $100 once for making ONE genuine espresso out of one, however I used some top quality, fairly tolerant beans (Costa Rican Organic), my Vario grinder (about $700) plus temp surfed it to get it as good as I could manage. It was an OK+ end result which was ruled (via blind testing) to be equal to the host's $8,000+ setup. Mind you, said host was a clueless wannabe barista... If I had used his gear there is no way it would have been a close comparison. matth3wh, trentski, level3ninja and 1 others like this. I managed to throw out my mum's Brevilla 'Some-a'roma not long ago... we all pleaded with her not to buy it in the first place. Good bye money. I did wonder if we had two stacked on top of each other whether we could make coffees quickly enough. Aeropress / hand grinder / pour over and your microwave + op shop plunger for milk are going to deliver better results and not break and end up in landfill. I had a laugh. Tom Lehrer: "Just what I always wanted, just not very much". Just think - two stacked could work (after you mod the coffee one & add a grinder) - one for the shot, the other for milk. That should cut coffee for 4 down to fifteen minutes. Simples! Or just buy one to learn how to froth milk with a (very) basic machine and use my "stirrer plunger" (chem lab stirrer & plunger combo - avoids the brewed plunger taste) / aeropress / Carmencita (aka moka pot) / Rommelsbacher (i.e. electric Carmencita) to make a far better coffee with a lot less grief. I read a bit of this to my wife as she got a Breville "Something-or-oma" for free with a credit card. I didn't really drink coffee before I met her. After hearing the pondering if a double-decker version could make coffees fast enough she said, "It was a good little machine." I agreed because it got me on the pathway to excellent coffee. She said, "Yeah... that was the most expensive free coffee machine ever!" Magic_Matt, matth3wh, magnafunk and 1 others like this. Spot on. You can start the journey somewhere. Or not even go on a journey. It's not the end of the world. A dirty secret... I have a friend who uses a BES870 with pressurised baskets and he is still happy with the coffee he puts through it. level3ninja and WarrenK like this. I started my coffee journey with a 2nd hand $80 Krupps and thought it made great coffee. Then onto a $200 new Sunbeam and thought that coffee was even better ... then onto 2nd hand Gaggia Baby and so on. It has to start somewhere and develops on from that. Nice progression Moonshine! I like the happy ending with the Bezzera Strega. I wouldn't mind visiting that Strega happy place too one day. Just thinking something like the Flair manual espresso maker or Nanopresso + the Aldi or Bellman stovetop steamer for steaming milk might be a better combo than the Aldi alone. Interesting that my Local Aldi now has stock that hasnt moved on special for $99. My very first machine was a Cafe Roma, followed by a Rancillio Silvia V2 then a Lelit Dianna. Just get yourself a drip filter machine. Seriously, why pay over the odds for stale coffee which you won't be satisfied with when you can have fresh filter coffee for a very low outlay?